The scientific method (Dr. OPHERC) is a way to gather evidence in order to develop a scientific explanation of phenomena. After making interesting observations (O), we identify problems (P) and questions for investigation. However, it is important that the questions we ask are "testable". Without a testable question to start our investigation, we won't be able to gather meaningful evidence. What is a testable question? A testable question asks something that can be measured and observed (phenomena) through experimentation. In other words, a testable question can only be answered by gathering evidence. If your question does not require collecting data (qualitative and quantitative observations), then your question is NOT "testable". Another way to think about is in terms of a controlled experiment. A testable question asks how one change (independent variable) has an effect on something else (dependent variable). Testable questions examine cause and effect relationships. In other words, testable questions look into how an independent variable (IV) affects a dependent variable (DV). How does (IV) affect (DV) ? What is the effect of (IV) on (DV) ? What effect does (IV) have on (DV) ? Testable questions are not related to personal preference, moral values, the supernatural, or things that cannot be measured. Just remember: Testable questions do not ask about things that are NOT considered to be phenomena! How do you turn a topic into a testable question? Now it is time that we learn how to develop our own testable questions so that we can begin designing our own controlled experiments! It is important that we choose topics that are meaningful and of interest to us. Therefore, the next question is, how do we take a topic (that interests us) and turn it into a testable question for investigation? 1. First, make two lists. List everything you can measure about your topic of interest. List everything that you can change/treat differently to your topic of interest. List everything you can measure about the tomato plant (DV): height of plant, number of tomatoes, color of tomatoes, water content of tomatoes, number of leaves, mass of tomatoes, density of tomatoes, depth of the roots, circumference of tomato, pH of the tomatoes, etc. List everything that you can change/treat differently to your tomato plant (IV): amount of sunshine, type of light, amount of soil, type of soil, amount of compost, type of compost, species of tomato plant, amount of water, temperature, humidity, number of seeds in the pot, type of pot, pH of the soil, pH of the water, type of water, etc. The first list are possible dependent variables. The second list are possible independent variables. 2. Next, pick one item from each list that interests you most. You are essentially picking one dependent variable and one independent variable. 3. Finally, choose an appropriate testable question format and fill in the blanks with the appropriate variables. What is the effect of the amount of water given to a tomato plant on the water content of tomatoes? Watch the video below on how to write testable scientific questions for investigation! Answer the questions below using information from the blog post and video. Write the question and answer in complete sentences. 2. What is NOT a testable question? 3. What are the two parts of a controlled experiment that are in every testable question? 4. What are the 3 steps to turning a topic into a testable question? 5. Write 3 more testable questions about the tomato plant by following the steps in question #4. 6. Follow the steps for turning the topic "Cafeteria Pizza at MS 88" into a testable question. Make sure to outline each of the 3 steps to get full credit. A controlled experiment is an experiment in which the scientist changes/manipulates only one thing to observe and measure the effects of that one change. Below is an outline of the parts of every controlled experiment. In order to begin developing scientific questions for designing our own controlled experiments, we must fully understand the parts of every controlled experiment. Independent Variable (IV)/Experimental Group (EG): The one part of the experiment that is changed/manipulated or given different treatment by the scientist (cause). Dependent Variable (DV): The part of an experiment that changes in response to, or affected by, the independent variable. This change is what the scientist observes and measures throughout the experiment (effect). Constants (C): The parts of an experiment that are kept the same for all groups and trials to ensure a fair test. Control Group (CG): The group in an experiment that is “normal” or untreated to be compared with the experimental group. Keep in mind that there is not a control group in every experiment. There is only a control group if there is such thing as a "normal" or untreated condition. The following key words can help you to identify the parts of a controlled experiment. Every controlled experiment investigates how an independent variable (the one thing changed by the scientist) has an effect on the dependent variable (what the scientist measures and observes). Answer the questions below using the video and your notes from class. Write the questions and answer them in complete sentences. 1. Fill in the blanks to write the scientific, testable question under investigation FROM THE VIDEO. What is the effect of the type of drink on _______________? 4. What does "DRY MIX" stand for? Take a look at the two scientific questions below. These questions were designed and tested by middle school students in New York City. They are not by any means perfect controlled experiments, but they do provide examples of how a student scientist studies how making one change (independent variable) has a measurable effect on something else (dependent variable). You may click on the question to see the details of the entire project. After reviewing these two projects, answer the questions that follow. What is the effect of air pressure on how high a basketball bounces? How does the amount of baking soda affect the the explosion of a volcano? 1. Identify the independent variable (IV), dependent variable (DV), constants (C), and control group (if there is one) for the two question above. 2. What two parts of a controlled experiment (among IV, DV, C, and CG) are included in the actual questions for each experiment above? 3. Rewrite the questions above, but replace the independent variable in the example with "IV", and dependent variable with "DV". For example, "How does the amount of water affect the height of a fig plant? "How does the (IV) affect the (DV) ?" A controlled experiment is an experiment that is conducted under a setting that is “controlled” by the scientist with the least possible influence from outside factors. A controlled experiment compares an experimental group with a control group in the exact same conditions with the one exception of a special/different treatment given to the experimental group. The control group represents the "normal", "standard" or untreated condition. The experimental group is the one part of the experiment that is changed/manipulated (given different treatment). The constants are everything else you keep the same to ensure a fair test. Francesco Redi's Controlled Experiment: Do maggots (young flies) come from rotting meat? To better understand controlled experiments, let's look at Francesco Redi's famous controlled experiment on maggots and meat as an example. Francesco wanted to find the answer to the question, "Do maggots (flies) come from rotting meat?". This may seem like a really silly question, but in Francesco Redi's day (1600s), people actually believed that flies and maggots were generated spontaneously from meat. Take a look at Redi's experiment below. What conditions did Francesco keep the same? What was the one special/different treatment given to the meat? Louis Pasteur's Controlled Experiment: Can microorganisms (germs) generate spontaneously? Louis Pasteur also conducted a famous controlled experiment. His experiment addressed the question, "Can microorganisms (germs) generate spontaneously?" For hundreds of years before Louis Pasteur, scientists believed that microorganisms (living things too small to see with the naked eye) came from thin air. Below is Pasteur's experiment. What conditions did Pasteur keep the same? What was the one special/different treatment given to the flasks? A controlled experiment is usually the fairest and most accurate way for a scientist to gather evidence to test a claim (hypothesis). Therefore, we will be using controlled experiments, like Francesco Redi and Louis Pasteur, in science class this year as we develop scientific explanations of phenomena that interest us. Another important thing to note about controlled experiments is that they are super easy to replicate (copy). Therefore, any scientist should be able to gather the same evidence and results when conducting the same experiment. In other words, if you performed Francesco Redi's famous experiment from the 17th century today, you would get the exact same results (replicated results)! However, keep in mind that controlled experiments have their limitations. First of all, not every experiment can be controlled in a laboratory setting. For example, if you want to study things in nature, such as how specific plants and animals interact in the rain forest, there are many factors that you would not (and should not) be able to control/change. Furthermore, controlled experiments do not necessarily represent real-world conditions, and can therefore create unrealistic results. For example, if a scientist is able to prove the effectiveness of a new drug (medicine) in a controlled laboratory setting, this does not necessarily mean that the drug will be as effective among people who have very different diets and live in very different environments. Perform Redi and Pasteur's famous controlled experiments here! Then answer the questions below. 2. What are the two "groups" in a controlled experiment? 3. What is a control group? 5. Identify the experimental and control group in Francesco Redi's controlled experiment. 6. How was Louis Pasteur able to gather evidence to prove that microorganisms do not generate spontaneously? Explain. If you need help, review Louis Pasteur's experiment here. 7. Why do you think it is important to keep all conditions in a controlled experiment the same except the one special/different treatment? 8. Why is it important that you can "replicate" a controlled experiment? 9. What is one limitation of a controlled experiment? Watch the video below on a controlled experiment studying the effect of ozone on plants Then answer the questions in your science notebook in complete sentences. 1. What was the question the scientists were trying to answer through this controlled experiment? 2. How were all of the plants treated the same? 3. What is a variable? 4. What is the variable (one thing changed) in this experiment? 5. What was the control/control group in this experiment? 6. What is a control/control group? 7. What do the scientists measure/record everyday in this experiment? 8. Why do you think it is important that scientists only test one variable in an experiment? 1. What was the control test/group in the dolphin experiment? 2. What was the experimental group in the dolphin experiment? 3. How do you think the students could have improved their experiment? A scientific explanation is the scientific way of explaining phenomena we observe by supporting a claim about what we observe with evidence and reasoning. What are phenomena? Phenomena are things, events, or circumstances that can be studied and observed. Octopus mimicry, gravity, and global warming are all examples of phenomena. We can study and observe these things, events, and circumstances using our five senses, and/or with scientific tools and technology. On the other hand, ghosts, UFOs, and Big Foot are not considered phenomena. Only a select few people claim to have observed these things, but even the fanciest technology and equipment have yet to be able to study, much less detect, these things. Scientists do not develop scientific explanations of things that are not considered to be phenomena. This is simply because we cannot gather evidence, which is a critical part of a scientific explanation. However, there are plenty of phenomena that we cannot see, but that we can still detect and study. Black holes are an example of such phenomena. A black hole is a place in space where gravity is so strong that even light cannot escape. Because no light can get out, people cannot see black holes. They are invisible to the human eye. Although scientists cannot directly observe black holes, scientists can see how the extremely strong gravity of a black hole affect the stars and gas around a black hole. When a black hole and a star are close together, a super high-energy light is created. Scientists can use satellites and powerful x-ray telescopes in space to see this super high-energy light. Now that we have a better understanding of "phenomena", let's reflect on two phenomena we observed/studied last week in order to develop scientific explanations of them. Scientific Explanation I: "Is air matter?" Sometimes scientists make a claim (answer to the question) about phenomena before collecting evidence through an experiment via observations and background research. Other times, scientists collect as much evidence as possible first in order to make a valid claim. In this case, we collected the evidence first. In order to answer this question (make a claim), we first had to collect evidence. Below are the procedure we used to gather evidence. 1. Copy the table in your science notebook (below). 2. Measure the mass of the balloon (with no air) on the triple beam balance. Record the unit. 3. Blow up the balloon until the circumference is 30-40 cm. Tie a knot. Measure and record the mass of the balloon in the table below. Record the unit. 4. Blow up another balloon until the circumference is 50-60 cm. Tie a knot. Measure and record the mass of the balloon in the table below. Record the unit. In order to make sense of our evidence to answer the question, "Is air matter? ", we had to do background research to understand what defines matter. According to Glencoe NY Science Grade 7, "Matter is anything that takes up space and has mass". Therefore, since the amount of space the balloon took up (volume) and mass increased as we blew more air into the balloon, we can make the claim that "air is matter". FINAL Scientific Explanation I: Is air matter? Air is matter (claim). We found that the mass of the balloon increases each time we blew more air into it. When the balloon had no air, it had a mass of 1.9 g. When we blew the balloon to 35 cm, the mass went up to 2.1 g. Finally, when we blew the balloon to 55 cm, the mass increased even more to 2.4 g (evidence). According to Glencoe New York Science Grade 7 (pg.243), “Matter is anything that takes up space and has mass”. Therefore, the increasing size of the balloon and mass show that air takes up space and has mass, which are the defining characteristics of matter (reasoning). Scientific Explanation II: "Are the two liquids the same?" Sometimes scientists make a claim (answer to the question at hand) about phenomena before collecting evidence through an experiment via observations and background research. Other times, scientists collect as much evidence as possible first in order to make a valid claim. In this case, we collected the evidence first. 1. Record as many qualitative observations of each liquid as you can. 2. Measure and record the mass (with the unit) of liquid A and B. 3. Measure and record the volume (with the unit) of liquid A and B. 4. Calculate the density of liquid A and B by dividing the mass of each liquid by the volume of each liquid. The unit is g/mL. Therefore, since the density of the two liquids were different, we can make the claim that the two liquids are different. FINAL Scientific Explanation II: Are the two liquids the same? The two liquids are not the same (claim). Although both liquids were clear, we found that the two liquids had different odors. Liquid A had a harsh, burning odor, while liquid B had a more sour odor. Furthermore, when we calculated the density of each liquid, we found that liquid A had a density of 0.8 g/mL, while liquid B had a density of 1.05 g/mL (evidence). According to Wikipedia.org, "different materials usually have different densities". Furthermore, according to middleschoolchemistry.com, "“…each substance has its own density because of the atoms and molecules it is made from.” Therefore, since odor and density are properties unique to different materials, we know that the two liquids are different. Scientists develop scientific explanations of phenomena. This is because phenomena are things we can observe, study, and things of which we can collect evidence. This coming school year, you will hear the word "phenomena" regularly. When you hear about stories of ghosts and UFOs this coming Halloween, be a scientist and ask the story teller... What is your evidence? What is your reasoning?! Answer the questions below in complete sentences. 2. What are two examples of things that are considered phenomena? Why are they considered to be phenomena? 3. What are two examples of things that are not considered to be phenomena? Why are they NOT considered to be phenomena? 4. Why don't scientists study things that are not phenomena? 5. Are black holes considered to be phenomena? Why or why not? 6. Do scientists always make a claim (hypothesis) before collecting evidence? Explain. 7. How do we know air is matter? 8. How do we know the two liquids are NOT the same? 9. Explain how background research helped us to develop our scientific explanations to the questions, "Is air matter? ", and "Are the two liquids the same?". Last week, we learned that the Scientific Method is an organized method used by scientists to find and gather evidence (data) to support a claim (argument) about what the scientist observes. There are many versions of the scientific method, but all versions of the scientific method involve trying to answer a specific question, and experimenting to find the answer. Observation: The observation is simply any information gathered using the senses or an instrument. A scientific investigation begins with an interesting observation in the world that generates questions that can be tested. Problem/Question: The problem/question is the specific question the scientist will attempt to answer through experimentation. Hypothesis: The hypothesis is the claim of the scientist, or an educated guess about the answer to the problem/question. A hypothesis is based on sufficient observations, prior knowledge, and background research. Experiment: The experiment is when the scientist actually tests his/her hypothesis for supporting evidence using detailed procedures, appropriate materials, and scientific measuring tools. During the experiment, the scientist records all of his/her qualitative and quantitative observations. Results: The results are all of evidence (the qualitative and quantitative observations) gathered throughout the experiment. The results are often displayed in tables, charts, and graphs for further studying. Conclusion: The conclusion is the reasoning of the scientist that explains the meaning or significance of the results. In the conclusion, the scientist links the evidence from the experiment back to the original claim (hypothesis). Remember! Using the scientific method does not always provide the necessary evidence to support the claim of the scientist. Very oftentimes, the scientific method leads to new evidence that results in the scientist totally changing his/her original claim. During the first week of school, we learned that science is a way to develop explanations for what we observe, using the evidence we gather through our own experiments, and through the experiments of other scientists. A scientific explanation, so to speak, is the scientific way of explaining what we observe in the world (and outside of the world, too!). A scientific explanation is essentially a claim (about what a scientist observes/observed phenomena) that is supported with evidence and reasoning. The goal of a scientist is to develop scientific explanations to share with the scientific community, and the purpose scientific method is to gather the "evidence" component of the scientific explanation. But what is a claim? What is evidence? And what is reasoning?! These components of a scientific explanation (C.E.R.) have been outlined below. Claim: a conclusion that attempts to answer/address a testable scientific question. Evidence: appropriate and sufficient data from an experiment, other scientists' experiments, reading material, and/or other observations that support the claim. Reasoning: a justification that links the claim and evidence that incorporates appropriate and sufficient scientific principles; requires background research. Connecting the Scientific Method with C.E.R. Last week, we performed an experiment to gather evidence in order to develop a scientific explanation. The question we addressed was, "What is the most common color in a 2.17 oz Original Fruit bag of Skittles?" Below is an outline of how we gathered our evidence via the Dr. OPHERC. We will use class 711's data for our example. 1. The scientific method began with an observation. Observation: There are five different colors in a bag of skittles - red, yellow, orange, green, purple. Every time I eat a bag of skittles, the frequency (how many) of each color seems to be different. 2. This observation inspired, or led to, a question for investigation. Problem/Question: What is the most common color in a 2.17 oz "Original Fruit" bag of Skittles? 3. We made a tentative claim (hypothesis) to test, based on our observations, background research, and prior knowledge. Hypothesis: If purple is the most popular color of Skittles, then it will be the most common color in a 2.17 oz bag because the makers of Skittles will likely accommodate the preference of the consumers. Furthermore, according to Skittles.com, green should make up 19.7% of a 2.17 oz bag, yellow should make up 19.5% of a 2.17 oz bag, orange should make up 20.2% of a 2.17 oz bag, red should make up 20% of a 2.17 oz bag, and purple should make up 20.6% of a 2.17 oz bag. 4. We then tested our hypothesis through an experiment to gather evidence. 1. Open the bag of Skittles onto your sheet of paper towel. 2. Group your Skittles according to color. 3. Count how many of each color are present in your group’s bag and record this info in table 1. 4. Analyze your data by creating a bar graph on Table 2. 5. Make sure to label the graph showing colors and numbers of Skittles. 6. Form a conclusion. State whether your hypothesis was correct or incorrect and why. 5. Next, we graphed all of our data (evidence). 6. We then made a conclusion by determining whether or not the evidence gathered supported our original claim. The conclusion is essentially our reasoning. The conclusion addresses our original claim (was it correct? incorrect? ), provides our evidence, and links our evidence back to our original claim. Conclusion: My hypothesis was not supported through this experiment because I predicted that purple would be the most common color, and my results show that green is the most common color in this experiment. The average total number of candies in class 711 was 58.6 pieces. There was an average of 10.2 red candies, 13.3 yellow candies, 10.2 orange candies, 13.5 green candies, and 10.2 purple candies in a 2.17 oz bag. Class 711's results were different from class 711, 714, 715, and 716. My next step is to average the data from all four classes. Since every class has a different average frequency of colors, the results do not provide enough evidence to support or oppose my claim that purple is the most common color of skittles in a 2.17 oz bag. Furthermore, since Skittles.com states that green should make up 19.7% of a 2.17 oz bag, yellow should make up 19.5% of a 2.17 oz bag, orange should make up 20.2% of a 2.17 oz bag, red should make up 20% of a 2.17 oz bag, and purple should make up 20.6% of a 2.17 oz bag, it is important that we increase our sample size in order to have a fair test. Answer the following questions in your science notebook. Write the questions AND answer in complete sentences. 1. Why do scientists use the scientific method? 2. What is a scientific explanation according to this article? Cite your evidence. 3. How is the "reasoning" in a scientific explanation related to the claim and evidence? Explain. 4. According to this blog post, a claim is a conclusion that attempts to answer/address a testable scientific question. What is another way to define claim? 5. According to this blog post, evidence is appropriate and sufficient data from an experiment, other scientists' experiments, reading material, and/or other observations that support the claim. What is another way to define evidence? 6. Were we able to gather enough evidence through our Skittles experiment to support a claim that a particular color is the most common in a 2.17 oz bag of "Original Fruit" Skittles? Explain. 7. Using the scientific method does not always provide the necessary evidence to support the claim (hypothesis) of the scientist. What do you think a scientist should do in the case that the evidence does not support the claim (hypothesis)? Explain what you think should be the next steps for the scientist. Due: Monday, October 21, 2013. Take a look at the image on the left. What do you observe? A pair of eyes? A nose? A raccoon? 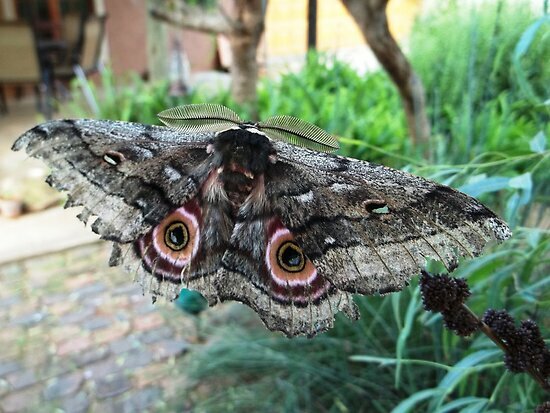 In reality, the image is a picture of a South African moth using "eye-spot mimicry". Check out a picture of the moth taken from a different perspective here. Surprised? If your instinct was to try to guess what was "in" the image, you are not alone. It is a very tempting response to the question, "What do you observe?". However, as scientists, it is important that we understand the difference between what we observe, and what we infer. In this blog post, we will first learn about observations, the types of observations, and the relationship between observations and data. We will then look into inferences, and how we can use our observations in order to make scientific inferences. In reality, an observation is any information you can gather using the five senses and scientific instruments and tools. In other words, what can we actually see, smell, taste, touch, hear, and measure in the picture? There are two sets of concentric circles, the colors of burnt red, orange, white, and varying shades of brown, and symmetrical patterns and colors. All observations are classified into one of two categories: qualitative observations and quantitative observations. Qualitative observations describe the characteristics or qualities of something with words, such as color, odor, texture, sound, taste, etc. Quantitative observations describe the measurement or quantity of something with numbers and a unit of measurement, such as "10 feet" or "150 grams". Keep in mind that the unit is extremely important; it is the only part of the observation that actually tells us the meaning of that number. The tomatoes have a green vine. The tomatoes have a mass of 15.5 grams. When a scientist collects data, he/she is simply gathering and recording qualitative and quantitative observations. Data describes all of the qualitative and quantitative observations that are collected as part of an experiment. Some experiments involve making more qualitative observations, while others involve making more quantitative observations. However, most experimental data is a combination of both qualitative and quantitative observations. For example, scientists who are studying the effects of global warming refer to both qualitative and quantitative data. Qualitative Observation: Polar bears live on ice. This polar bear appears to be clinging on to a melting glacier. Quantitative Observation: The arctic sea ice has declined since 1979, and has decreased by 1.57 million square kilometers as of 2013. On the other hand, an inference is a logical conclusion based on observations and prior knowledge. "Based on my observations of the tomatoes, I can infer that the tomatoes are fresh because they are bright red, round, and shiny, and have a mass of 15.5 grams, which means that the tomatoes have a reasonably high water content." In this example inference sentence, note how I incorporated both qualitative observations, quantitative observations, and prior knowledge in the "because" portion of the sentence. Without this important "because", I would not be fully supporting my logical conclusion (inference). Let's go back to our first picture example. I can infer that the object in the image is a winged insect using "eyespot mimicry" because of the symmetrical patterns and colors, concentric circles, and soft appearance. Again, note how the "because" portion of the inference is where I incorporated my observations and prior knowledge. “I infer ___________________, because ________________________." Check out the video below, created by Mr. Epp's science classroom. When watching the video, keep in mind that the word "precise" means accurate and exact. As scientists, it is very important that we understand the relationship between observations and inferences. In order to make a scientific inference, we must consider all qualitative and quantitative observations before making any conclusions. As we move into developing our own scientific investigations this school year, keep in mind that we will be collecting data (qualitative and quantitative observations) to develop our own scientific inferences and explanations of the phenomena we observe. 1. What is the difference between a qualitative and quantitative observation? 3. What is an inference? 4. How are observations and inferences related to each other? “I infer ___________________, because ________________________. STUDY your all vocabulary since the beginning of the school year, and your notes on observations, inferences, and cause-and-effect relationships. Also study the information on the "Cause and Effect: Human Activity and Global Warming", the "Observations vs. Inferences", and "What is Science?" blog posts. There will be a quiz tomorrow!